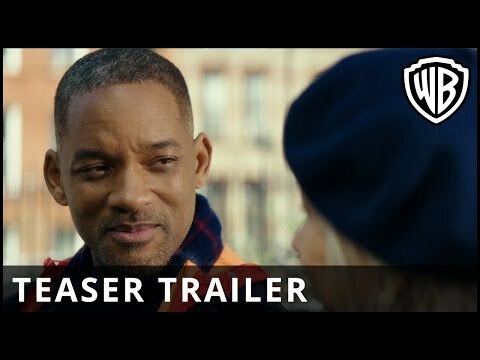 Big Willie is on the comeback trail and man, is he knocking it out of the park in the first trailer for Collateral Beauty. Yes, this is aiming at awards season and yes, this looks absolutely stunning and so, so poignant. And no that's not a tear running down my cheek...it's a waterfall!!! When a successful New York advertising executive (Will Smith) experiences a deep personal tragedy and retreats from life entirely, his colleagues devise a drastic plan to force him to confront his grief in a surprising and profoundly human way. COLLATERAL BEAUTY features an all-star cast, including Will Smith (Suicide Squad, Concussion), Edward Norton (Birdman or [The Unexpected Virtue of Ignorance]), Keira Knightley (The Imitation Game), Michael Peña (The Martian), Naomie Harris (Spectre), Jacob Latimore (The Maze Runner), with Oscar winners Kate Winslet (The Reader, Steve Jobs) and Helen Mirren (The Queen, Trumbo). Frankel directs from a screenplay written by Allan Loeb (Wall Street: Money Never Sleeps, 21). The film is produced by Bard Dorros (Triple 9), Michael Sugar (Oscar-nominated Best Picture Spotlight), Allan Loeb, Anthony Bregman (Foxcatcher), and Kevin Frakes (John Wick). Serving as executive producers are Toby Emmerich, Richard Brener, Michael Disco, Michael Bederman, Ankur Rungta, Peter Cron, Steven Pearl and Bruce Berman. COLLATERAL BEAUTY is presented by New Line Cinemas in association with Village Roadshow Pictures, alongside Anonymous Content, Overbrook Entertainment, PalmStar Media and Likely Story.